Existing in the Stikine River Provincial Park is a geological feature unparalleled in Canada. Eighty kilometres of steep-walled canyon, composed of sedimentary and volcanic rock, has been carved through eons of river erosion. In the bottom of this sometimes 300 m deep chasm flows the wild and unnavigable Stikine River, which varies in width from 200 m to as little as 2 m at a point near the Tanzilla and Stikine confluence. Sharp drop-offs border the entire Grand Canyon. These, combined with broken rock prevalent in the area, make it extremely dangerous to approach the canyon rim. Please be cautious and supervise your children at all times. The Grand Canyon, downstream from Highway #37 bridge crossing, is unnavigable by all watercraft. Do not attempt to navigate this section of the Stikine River. Only permitted air charter companies are authorized to fly into Stikine River Provincial Park. The Spatsizi River, upstream of Hyland Post, is a designated non-motorized area (ie. no jet boating or power boating) from spring break up until September 1. Motorized boat operators should be very aware and cautious of non-motorized (ie. kayak, canoe, raft etc.) traffic coming downstream. Please be sure to give appropriate right-of-way, carry all mandatory safe boating equipment and boat safely! Lying west of Highway #37, access is along the scenic Telegraph Creek Road which leads 110 km from Dease Lake. Visitors should note that this road is steep and narrow in some places. The main canyon on the Stikine runs from just west of the highway #37 bridge to Telegraph Creek townsite. History: The Tahltan First Nation were the original settlers in this area. The Tahltans lived at various seasonal locations along the Stikine River, trading with both the Cascas of the high interior and the Tlingits of the Pacific coast. Today, the Tahltans live in the communities of Telegraph Creek, Dease Lake and Iskut. In the mid 1860’s, the need for communications link to Europe initiated a survey of the Stikine for development of the Collins Overland Telegraph Trail. This project introduced the use of sternwheelers on the river, which brought telegraph wire and other construction materials to what is known as Telegraph Creek. This telegraph route was abandoned after cable was successfully laid across the Atlantic, linking North America with Europe. Cultural Heritage: There are numerous Tahltan native sites in the park. Conservation: The Stikine River Provincial Park consists of two ecosections, the Southern Boreal Plateau and Stikine Plateau. Special features of the area include the internationally significant Grand Canyon. Wildlife: A resident population of more than 300 mountain goats reside in the canyon. Many other species frequent the area, including the black and grizzly bears, Stone sheep, moose, caribou, wolf, coyotes, salmon, and numerous bird species. 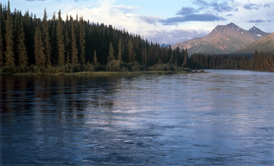 Canoeing and kayaking are permitted on the upper Stikine River. Please obey the signs as your own safety is at risk if they are disregarded. Caution: Downstream of the Stikine River – Hwy 37 bridge is unnavigable by any watercraft. Fish year-round for a variety of native species including Dolly Varden, Arctic grayling and rainbow trout, or try for Chinook salmon or steelhead (downstream of the grand canyon) during the late summer and fall. Anyone fishing or angling in British Columbia must have an appropriate licence. As you enter the park (going west from Dease Lake at approximately 60 km), you will notice a pullout parking area on the right. From here, a short trail leads to a viewpoint overlooking the Tuya River Valley. A Letter of Authorization (LOA) is required for visitors who wish to use horses within Stikine River Provincial Park. There is a mandatory “weed-free feed” requirement for any horses entering the northern parks, meaning that horses must be fed certified weed-free pellets for 72 hours prior to entering the park and throughout the duration of their stay within the park. The primary reason for the weed-free feed requirement is the growing concern of introducing invasive plant species (either through non-permitted feed or horse droppings) into a natural and pristine ecosystem in the park. To obtain an LOA, please contact the BC Parks Stikine Area Supervisor at 250 771-4591 ext.1. If there is no answer, please leave a detailed message stating your request for an LOA, your name, contact information and the date you wish to visit the park. Hunting is permitted within Stikine River Provincial Park, though many species are authorized under Limited Entry Hunting only. Hunting for moose and mountain goat, east of the Hwy 37 bridge, is restricted to Limited Entry Hunting only. Mountain goat hunting, west of the Hwy 37 bridge, is also restricted to Limited Entry Hunting only. A primitive boat launch is available on the west side of the highway #37 bridge. No firewood available. If you have to make a fire, keep it minimal, make sure it is extinguished, please spread ashes and rocks about. Fires should be used sparingly, as they are among the most serious visual impacts in the backcountry. Always carry a stove; use it for most if not all of your cooking needs and only build a fire when it is safe and will not cause further damage or deplete wood supplies. Please check for campfire bans and the Fire Danger Rating for the area you are visiting before igniting a fire in the backcountry. Limited burning hours or campfire bans may be implemented. To preserve vegetation and ground cover, please don’t gather firewood from the area around your campsite or elsewhere in the park (this is a ticketable offence under the Park Act). Dead wood is an important habitat element for many plants and animals and it adds organic matter to the soil. This park only has pit toilets – no flush toilets. There are pit toilets available at the following sites: Fountain Rapids, Chapea Rapids, Beggerlay Canyon, Hwy 37 bridge, and Hwy 37 pull-out. Wilderness, backcountry or walk-in camping is allowed, but few facilities are provided. Rustic campsites with fire rings, picnic tables, tenting areas, and pit toilets may be available at Fountain Rapids, Chapea Rapids, Beggerlay Canyon (all 3 are portage trails), and at canoe pull-out at the Highway 37 bridge. Please practice “leave-no-trace” camping and “pack out what you pack in”. Several private guide outfitter camps exist within the park, cabin trespass and construction of new structures is prohibited.